The story I promised about the stunning image pictured.. 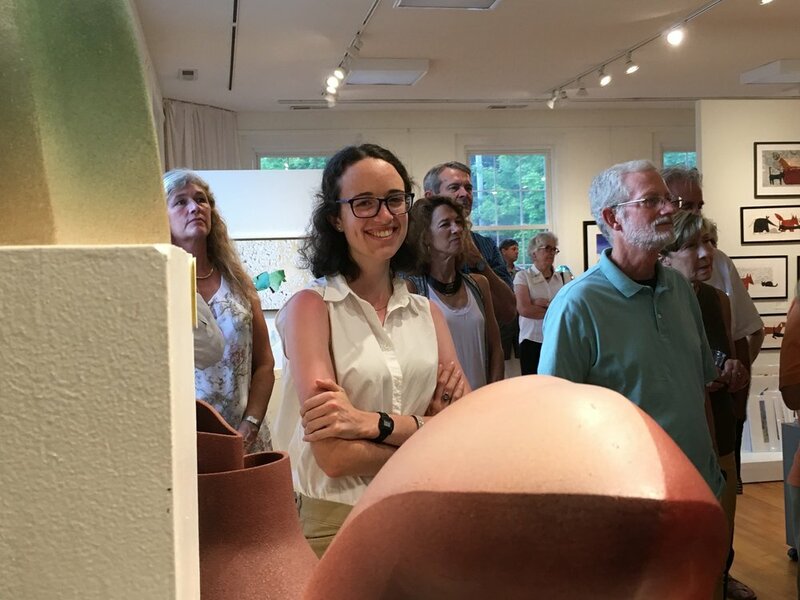 In August I received a call from Penland that my piece which was about to go up for auction had a small crack in it and they were concerned about it. 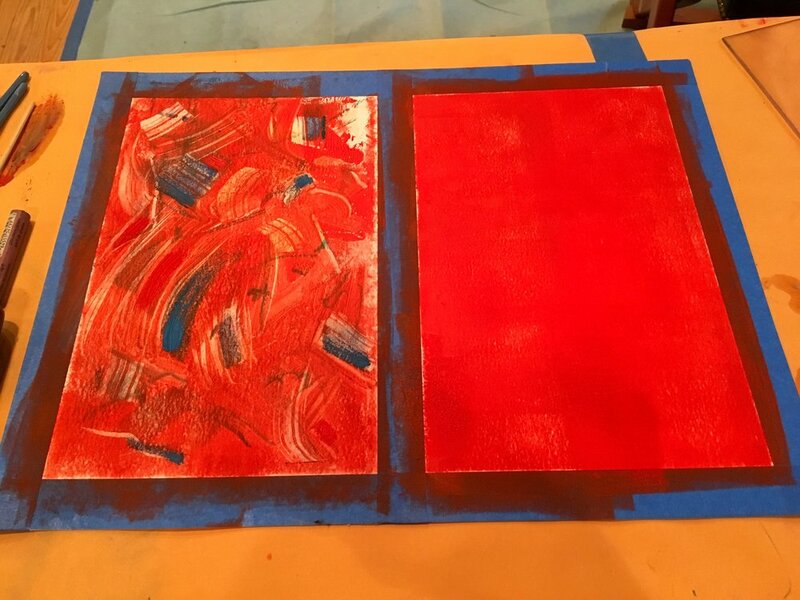 We decided, sadly that it would be best to withdraw the piece from the auction…. Naturally I was disappointed that it could not be used to raise funds for Penland. 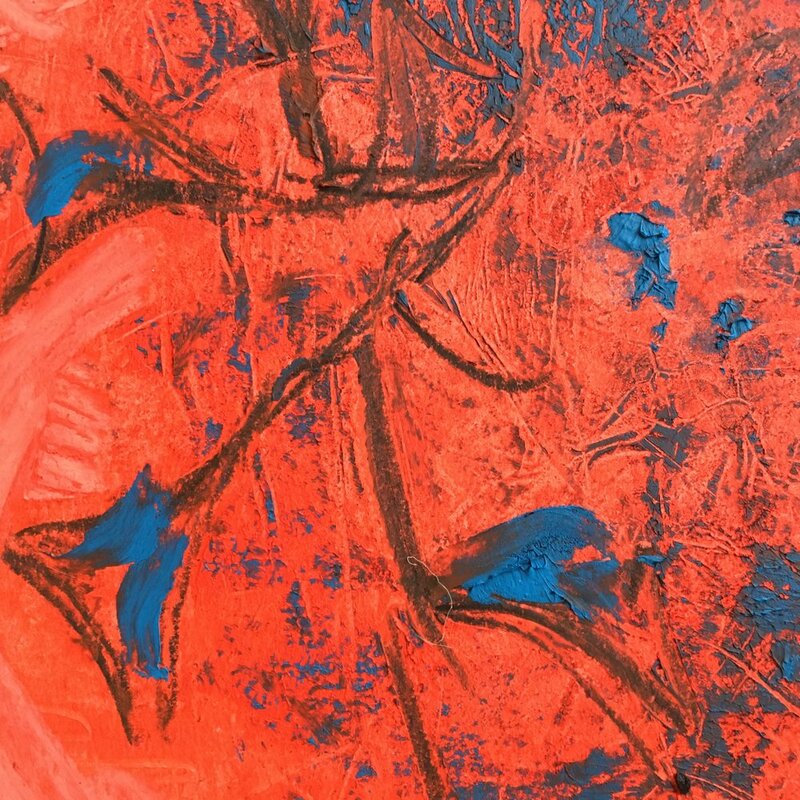 I was especially sad because I love this piece in spite of the small crack and started thinking about what could be done with it to show how special it is in spite of it’s imperfection….. It occurred to me that I would love for Paulus Berensohn to have it in spite of his recent death. I knew Paulus would love this piece all the more for its wabi sabi nature. 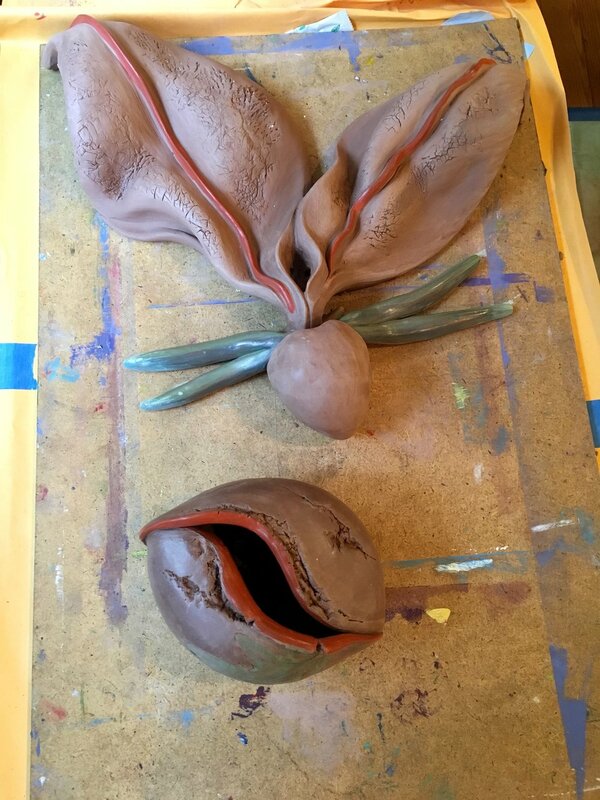 It also seemed an appropriate gift because the buckeye that had inspired it was a gift to me from a mutually loved friend, Jo Jeffers…. Anyway, I heard from Corn who kindly asked if I would like them to return the piece or what might I like to do with it? I told her how much I treasured my friendship with Paulus over the years and would like for it to be installed along the trail named in his honor. Not only did she like the idea but she generously offered to take it on a future hike and find an appropriate place for it. This was the best possible news! I thanked her and then waited…. Recently I received an email and she said that not only had she taken the Pod on a hike but had found the perfect place for it at the top of the ridge. She even hesitated to hammer a nail into the wood of the tree but instead found part of a broken limb conveniently waiting for the installation of my Pod. Attached was this stunning picture Corn took of Paulus’s Pod! It could not be more perfect really and brings tears to my eyes as I think about how satisfying he will find all the meaning behind this special gift. 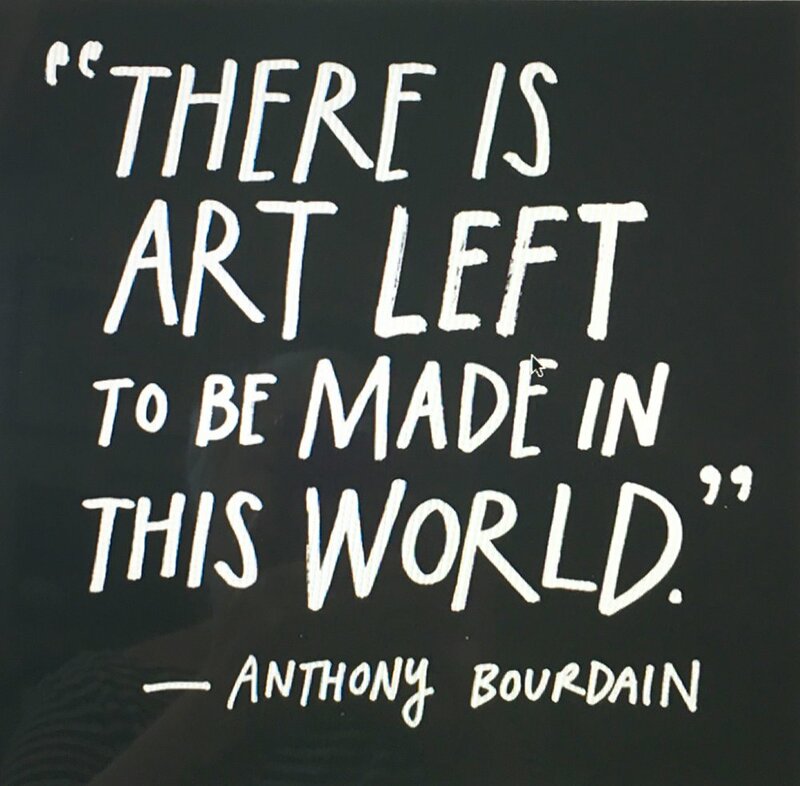 It was as if it was intended all along to be my last thank you to Paulus for all he gave me through his book, his philosophy of life and teaching and his presence at two of the workshops I taught at Penland. I was unable to be with him in the end but I know he knows how much I loved and admired him along with a multitude of others. I know his spirit lives on at Penland and I am so thankful to Corn and her assistance for making this happen. Now I look forward to returning to Penland for a little visit with Paulus along the trail. I am also anxious to meet Corn to show my appreciation in Person. 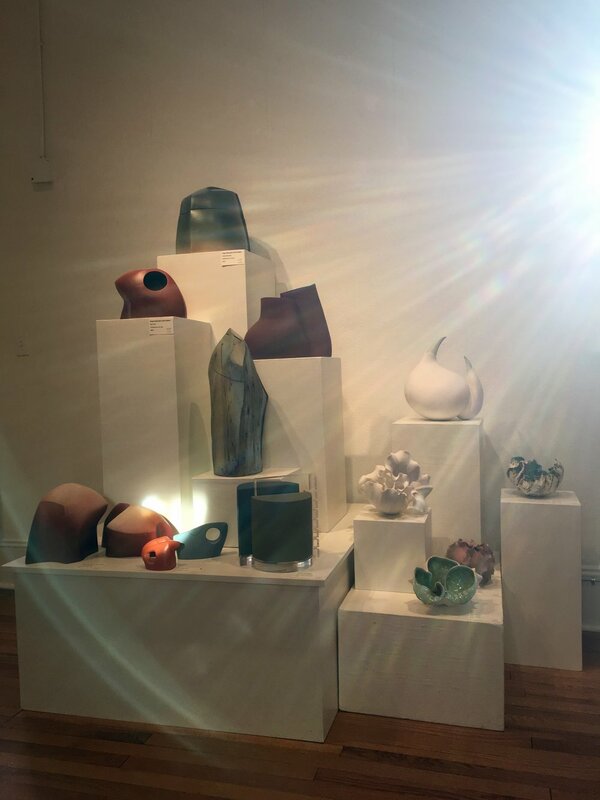 We hope you will a drive to beautiful Flat Rock, NC to take in this unusual show! BEEsmART is a pollinator themed exhibit on view in the main gallery from July 23 - August 31. The exhibit is intended to celebrate Greenwood's Bee City USA designation and to support the city's continued efforts to engage the community in promoting pollinator-friendliness. 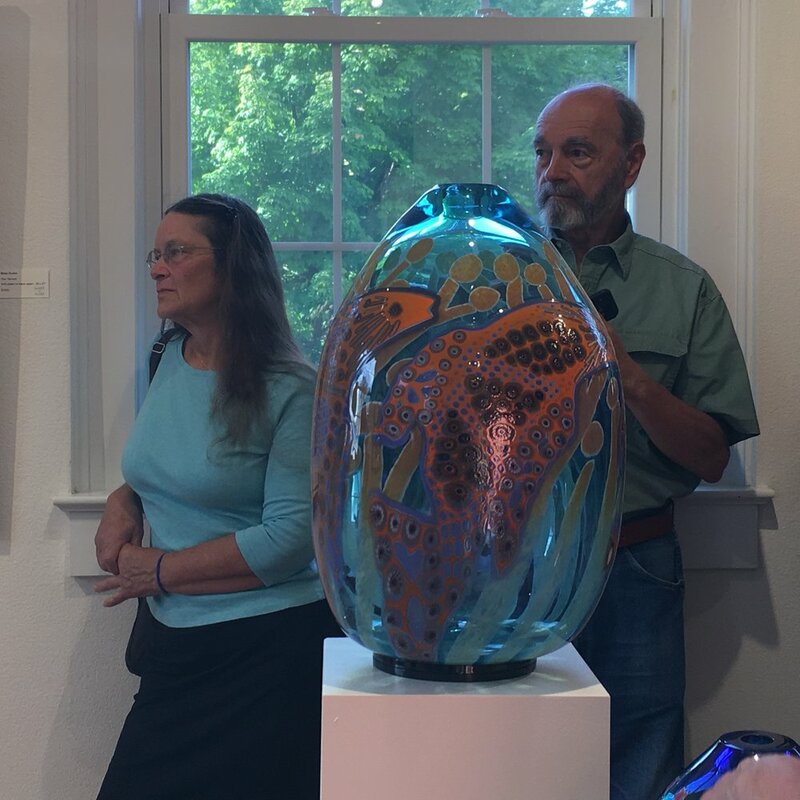 The exhibit features 54 creative works by local and regional artists which highlight the beauty and significance of native flora, plants, pollinators and gardens. 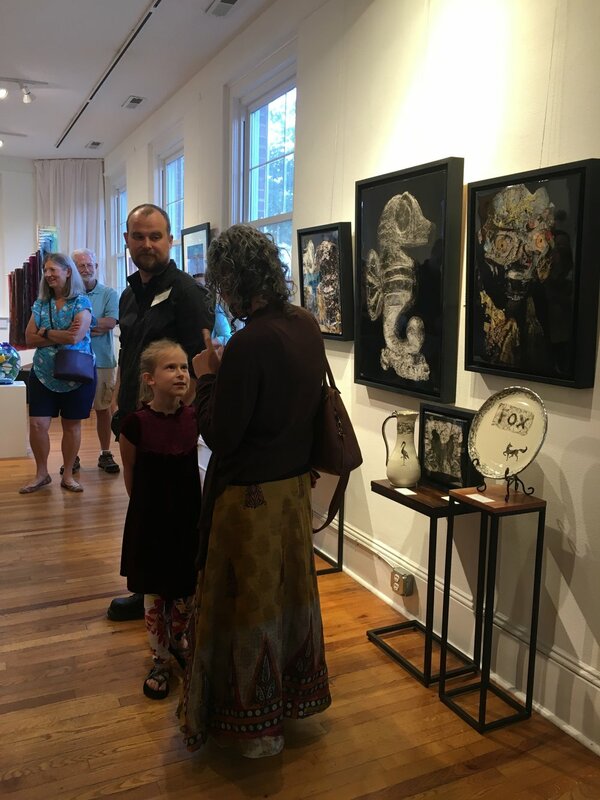 Thanks to everyone at the Arts Center of Greenwood for a beautiful show and exceptional reception! Special thanks to Jennifer Smith, director of the gallery, for a superb job of installing my work. It was the first time I have turned the installation totally over to someone else and I am thrilled with the results! I know she put creativity, time and effort into the installation so it would reflect my wishes....I know many other folks assisted her to make this happen and I thank each of you as well. 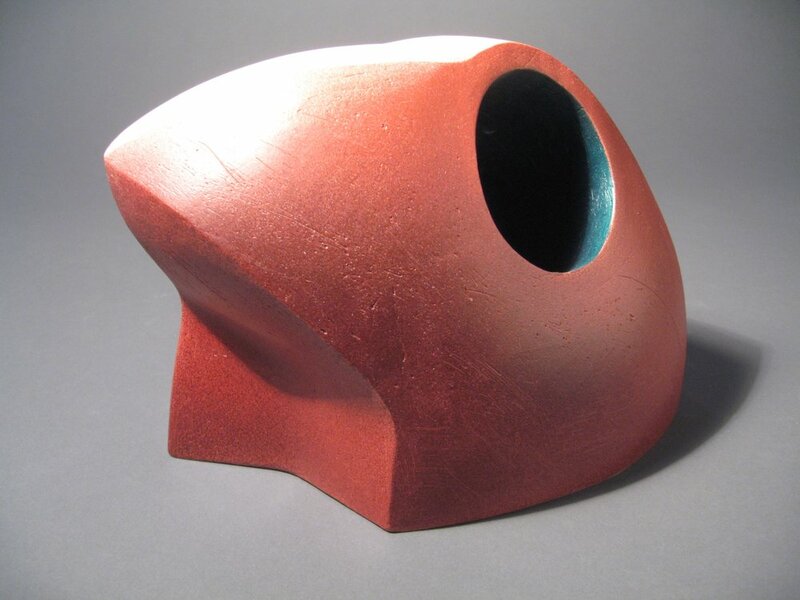 Special friends Chris Clamp and Elaine Quaive are among the invited artists so it is lovely to see our work together. The work featured was carefully chosen and displayed. As a teacher I was thrilled to also see the lively, colorful work in the junior gallery! 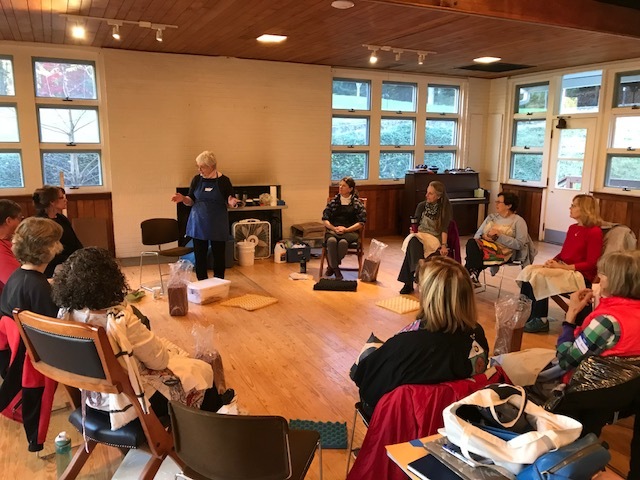 October 8-13, FINDING YOUR FORM THROUGH NATURE, an amazing group of 14 came together for an wonderful workshop that brought the outdoors indoors for inspiration! 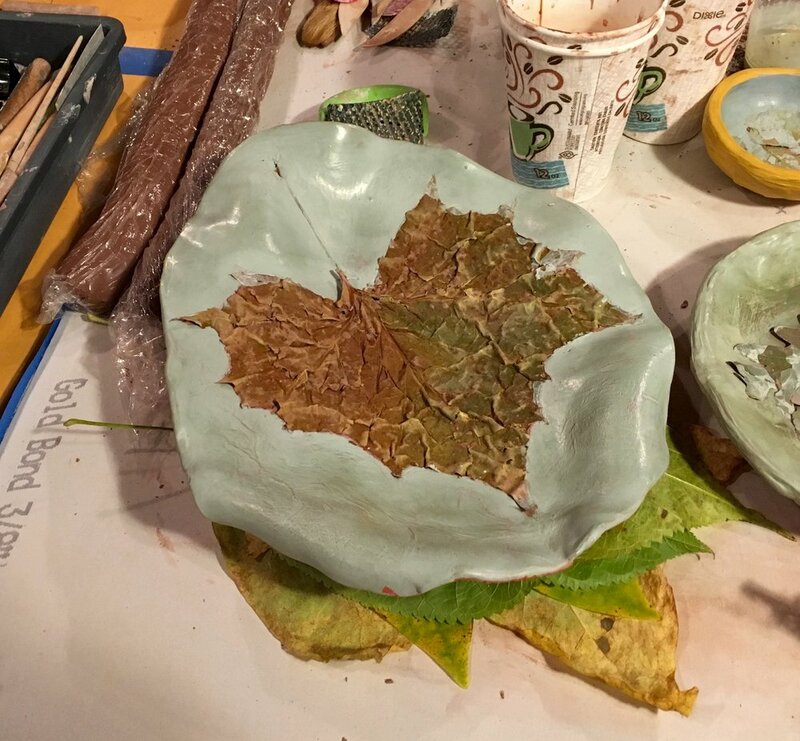 The result was a quiet explosion of creativity and 6 kiln loads of tiles, clay sketches, platters, signature pieces and meditation bowls!!! The members of our class, plus my assistant, Glory Day Loflin made my 3rd experience teaching at Arrowmont the best yet! My gratitude goes to each of you along with special thanks for the positive and welcoming attitude and efforts of everyone involved with Arrowmont. You set the stage for our experience in this workshop and it was awesome! The new studio in Clover, SC!!!!!!!!!!!!!!!!!!!!!!!!!!!!!! I see pure "potential" here! I will do my best to keep you posted..... My love and thanks to each of you for your support! Nature conjures images of the power of fecundity, the quiet of meditation, and the sensuousness of form. 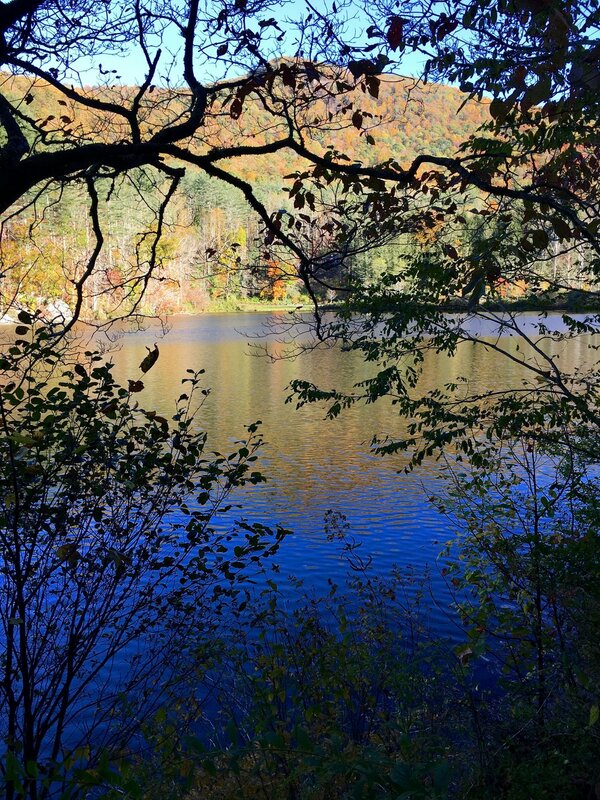 Though nature is often equated with vastness, the ocean or the Blue Ridge on a drive to Asheville, we overlook the magic that each of us are of nature. All life is either born, hatched or sprouted. 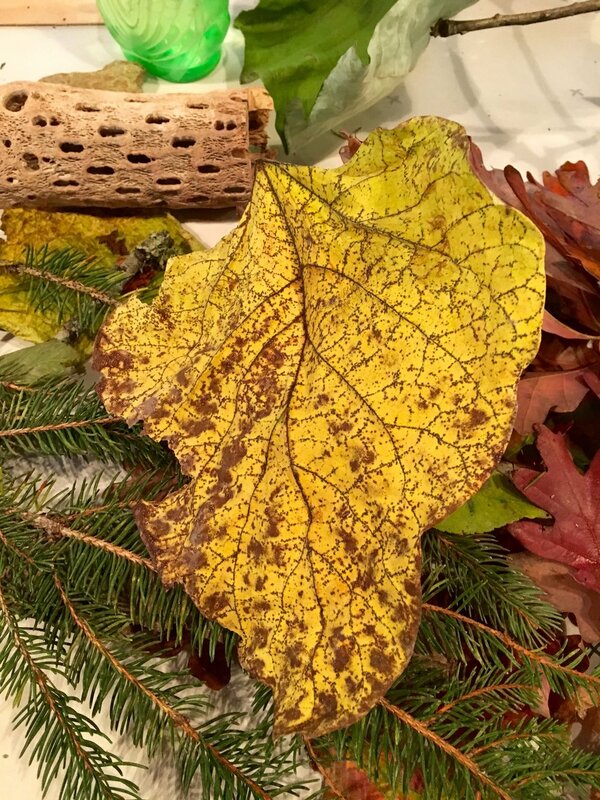 Alice Ballard reminds us that the miracle of nature is often condensed into the smallest pod, fruit, or twig that we step on or bypass in our rush to scenic grandeur. 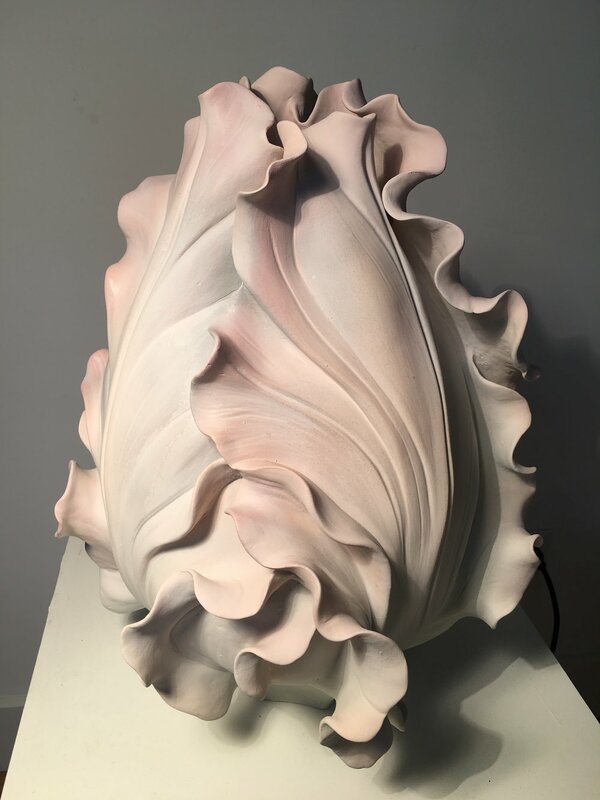 Alice began making her "White Works" in the 1980's after ..."discovering a bag of tulip bulbs beneath my studio sink that I had forgotten to plant in the fall." These bulbs had sprouted in the damp dark. A number of years later the "...series focused on the often tiny natural objects I pick up on my walks." 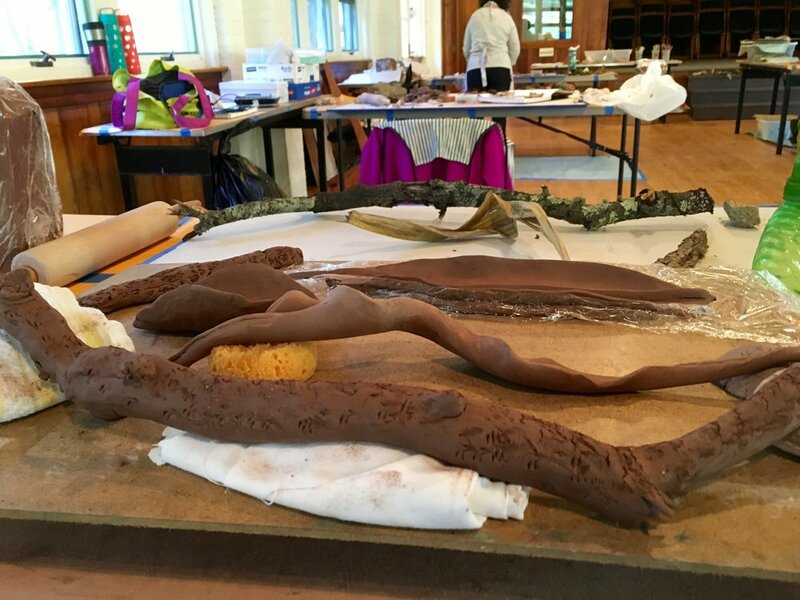 Alice creates A Walk Remembered by arranging and grouping her sculptural clay forms on low pedestals that make a winding path through Riverworks giving us a similar perspective for making our own discoveries on our walks. Alice's "White Work" is white earthenware burnished with white terra sigillata. Each is a hand built sculpture based on the small, often overlooked bits of nature - a shell, a seed, a twig. 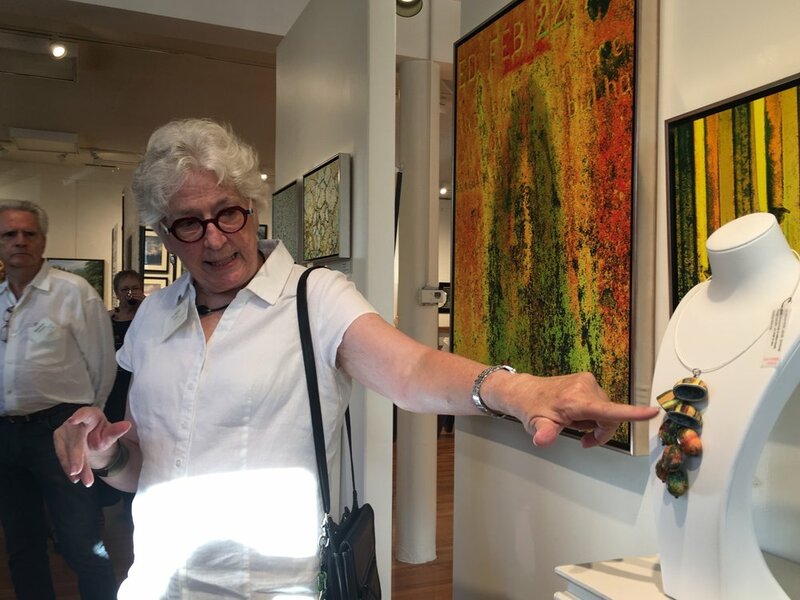 Through her exquisite craft she elevates these found natural bits and pieces to create a space of contemplation and appreciation of grandeur on a smaller scale. Though white has a number of personal associations for Alice, creating these works in white heightens our appreciation of their form without the distraction of color. 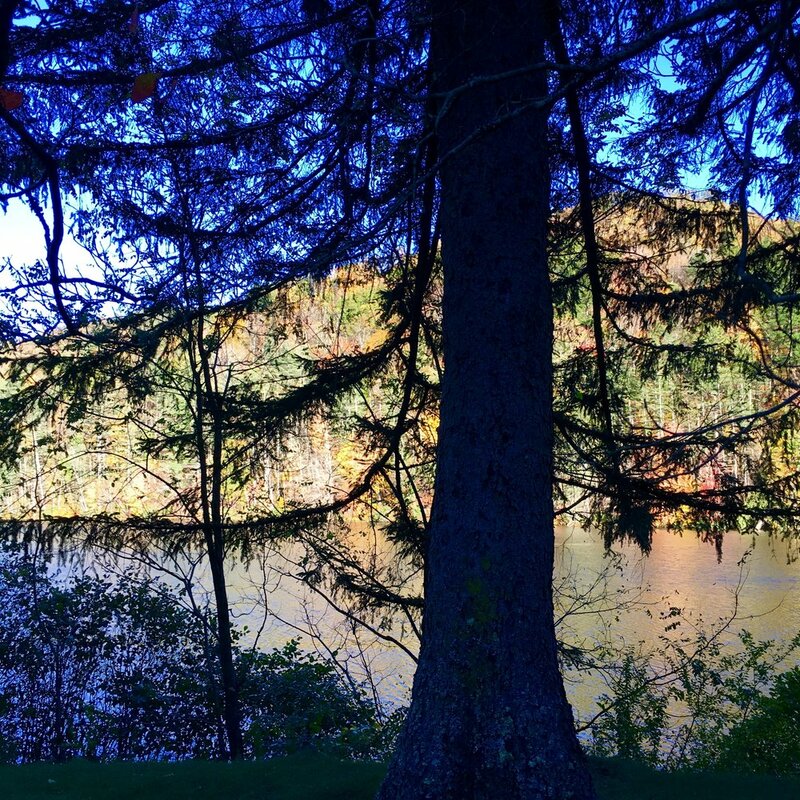 Alice recounts, "Nature to me is a constant reminder of the interconnectedness of all things. 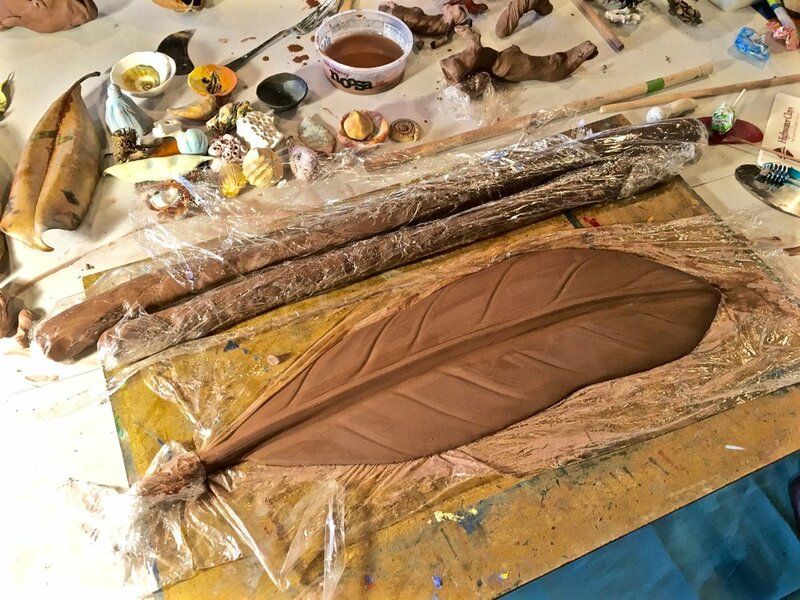 My attention is drawn to natural forms that become symbolic of rebirth, hope, and renewal." Alice's "White Works" relate to her life's journey through happiness and pain from Charlotte to Alaska to Greenville. As a self-described "eternal optimist", Alice beckons us to calmly, and with spiritual grace, join her on A Walk Remembered. Alice is retiring from teaching in Greenville. 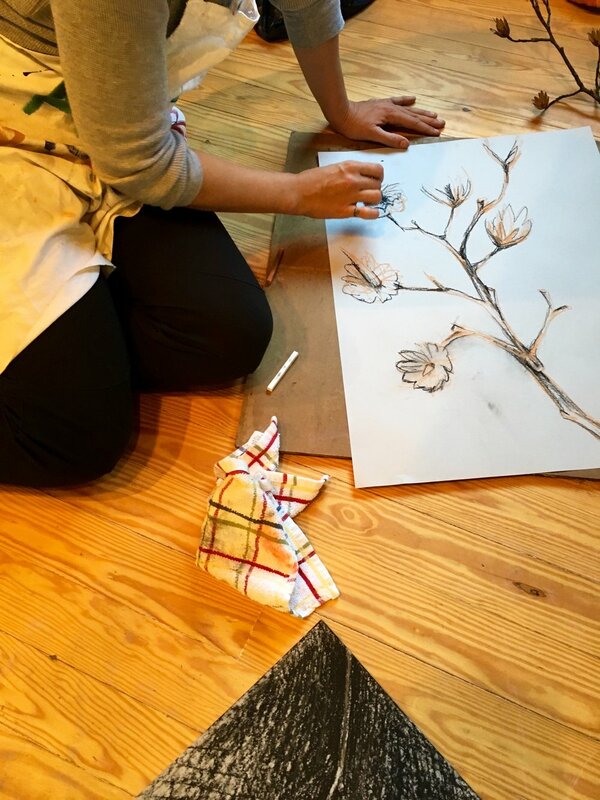 She and her spouse are building a home in an orchard that will provide fertile ground to discover more natural forms for her "White Works." 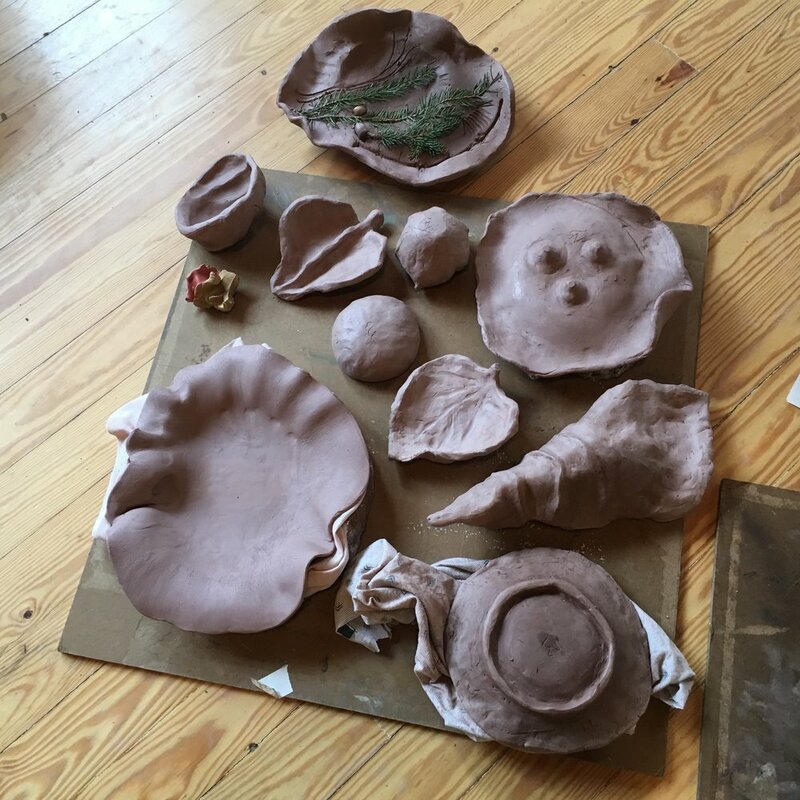 Alice has made art in an international ceramic colony in Macedonia and in India on a Fulbright Grant. She muses that her time in Alaska influenced her delight in white. For Alice, "White is like pure potential." 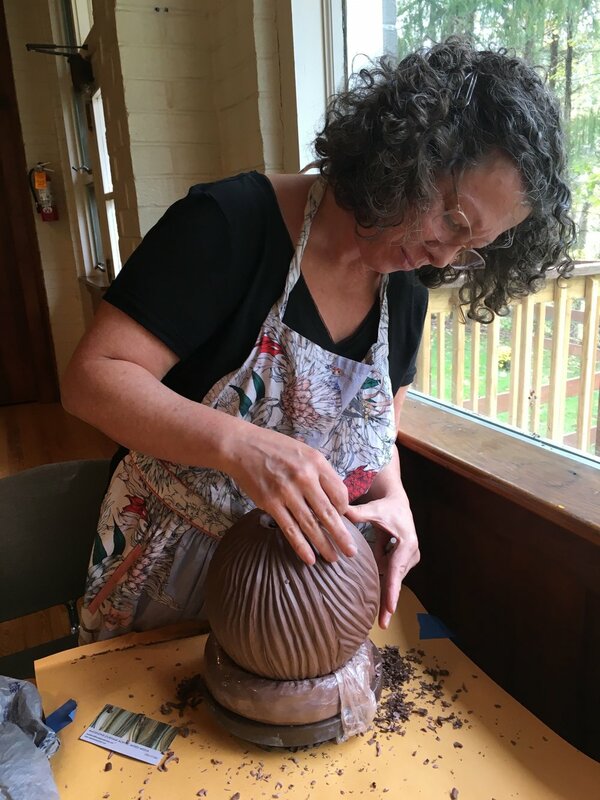 A CONVERSATION WITH CLAY, workshop, June 15, 16, 2018, Cullowhee Mt. Arts, Western NC U. PLEASE drop by to see our work some time during the 3 day show, April 13-15, 11-5. 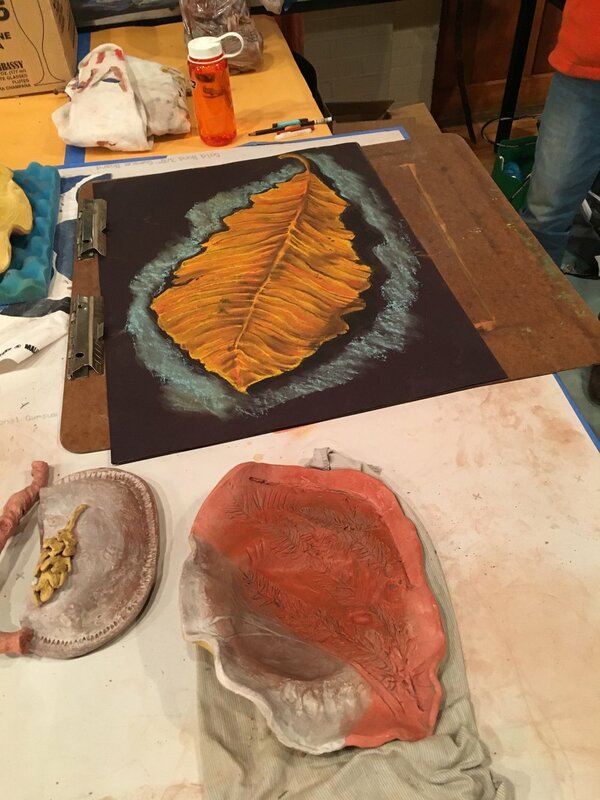 Our work will be displayed throughout her gallery and workshop space. Kate and I are looking forward to doing something fun and creative to show off the work so don't miss this Pop Up! Did I mention that this is also a celebration! Roger and I have purchased a small orchard and are building a small home and 2 studios in Clover, South Carolina! Did I mention that my son Ryan, his wife Jen and grandchildren Lily who is nine and Charlie who will be 6 in June will be just 10 miles down the road? The other best part is we are only about an hour and a half away from all the folks I love in Greenville. Yeah!!!!! So help us celebrate!!! Just one more week to visit "the "F"word" at Riverworks Gallery, open Wednesday through Sunday. 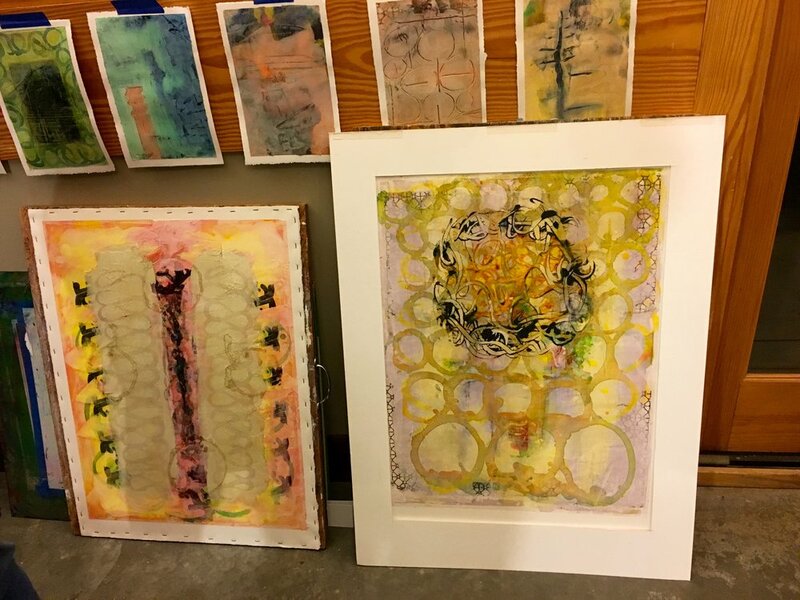 Work by Alice Ballard, Katya Cohen, Katrina Majkut, and Lynne Riding. Check the hours at the link below. 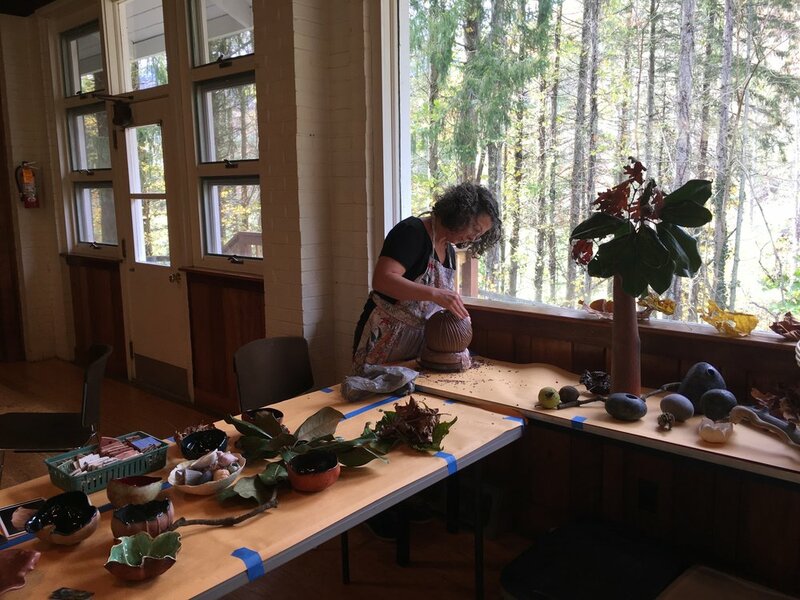 Lake Logan Retreat, a Cullowhee Mountain Arts event, October Oct. 25-30. 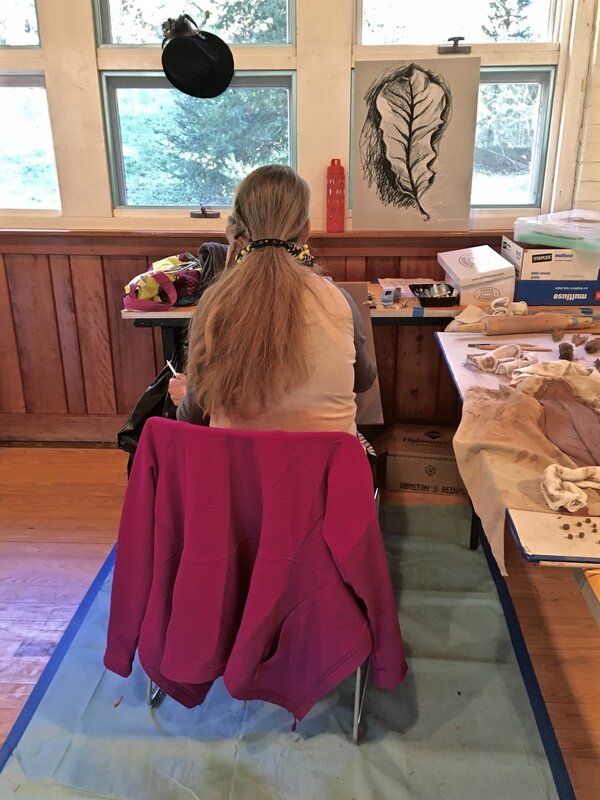 Let me share a bit about this amazing workshop/retreat at Lake Logan...Words like amazing, spiritual, calming, connecting, magical, FUN, kept coming up, so much so that on the last day we started talking about a reunion!!! 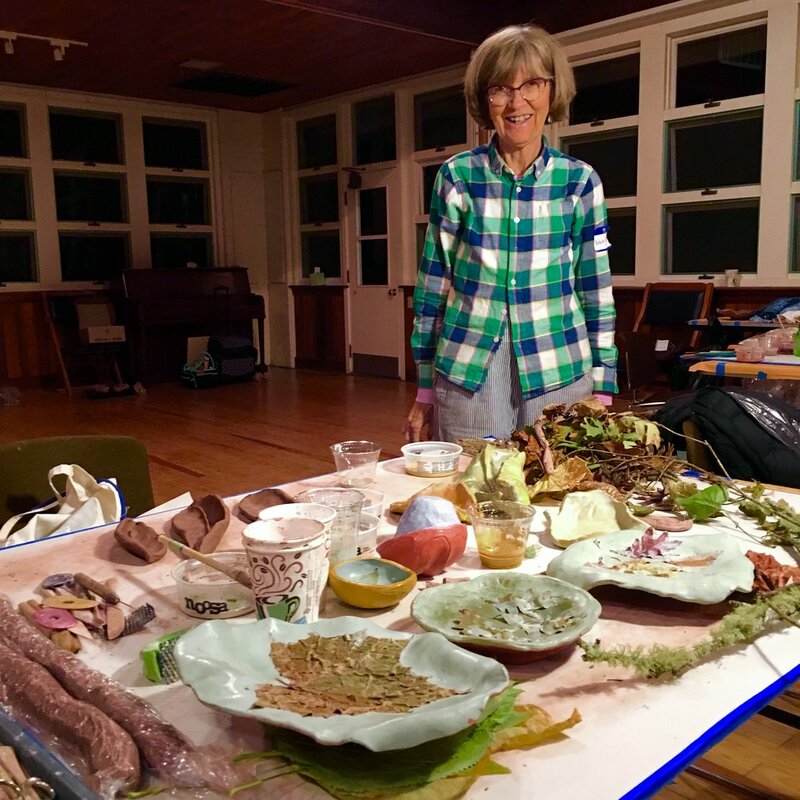 I declare it one of the most enjoyable, deeply spiritual and fun workshops I have done. I attribute this to Norma Hendrix for having the wisdom to make good choices when she put this workshop together her ability to be flexible and open to special opportunities that revealed themselves along the way. 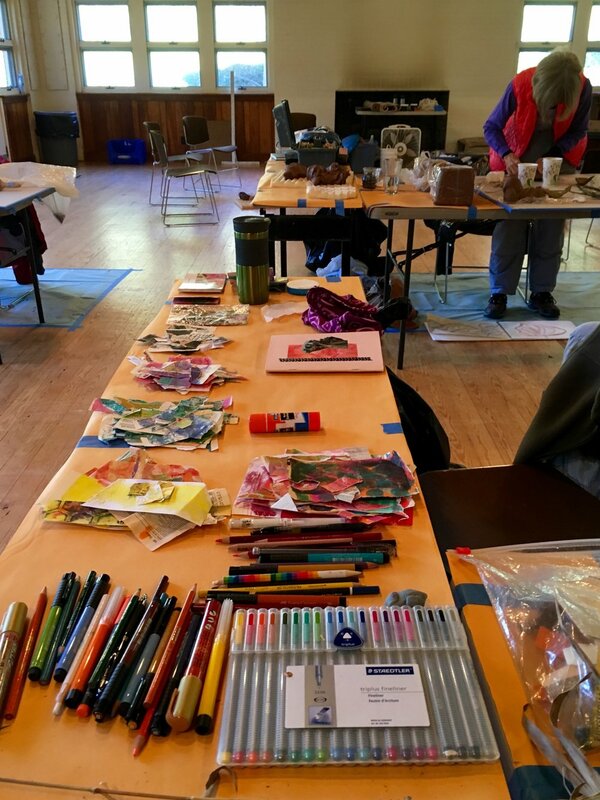 Next I thank each person in our workshop as well as those doing an mini artist-in-residency for their openness, flexibility, openness, humor and sharing attitude. I would also like to remember Paulus Berensohn, artist, dancer, poet, environmental activist, philosopher, and author of FINDING ONE'S WAY IN CLAY. I first met Paulus through his book. 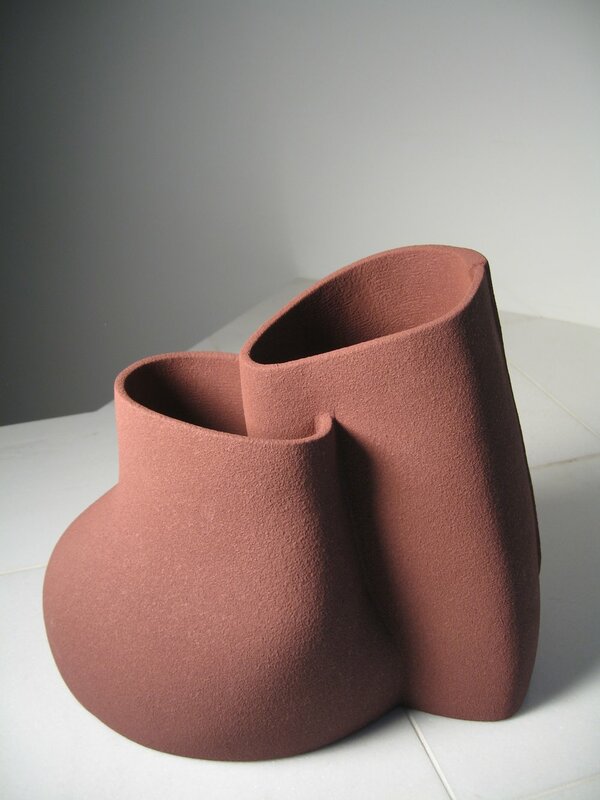 It was an important starting point for my approach to teaching and my work in clay for some twenty years. 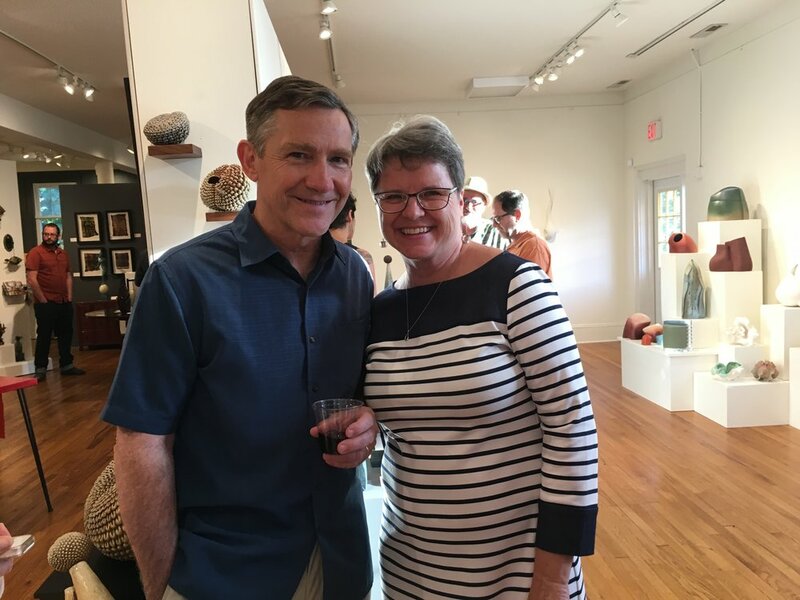 I finally met Paulus when I taught my first class at Penland called FINDING YOUR FORM THROUGH NATURE! From that point forward, I felt like I had known him for a life time. Time spent around Paulus was always a great gift especially when he read poetry... Although he is greatly missed we know he is now "changed addresses", as he was fond of saying. Now Paulus is part of everything. As folks in our group were sharing stories about Paulus, suddenly the lights in our studio flickered and went our very briefly. We all reacted at once laughing and exclaiming that it must be Paulus reminding us of his presence in the universe and that we are all still very much connected..... Thank you Paulus! The story that follows is about why I chose MACEDONIAN PEPPER the exhibition Trial by Fire. My Macedonia experience changed me forever and for this I am deeply appreciative…Risk taking, if taken for what one believes are the right reasons, often yields unexpected and special gifts that cannot be obtained in any other way. My “Macedonian Pepper” is a visual symbol for that gift….When i see it, visions of my Macedonia experience comes rushing back! An exhibition which is an installation poses special challenges. I thought I would share some details that will demonstrate the complexity and challenges of such an exhibition. The first step after conceiving the idea is consider how best to share your idea visually. In this case I wanted to invite the viewer to take a slow walk in order to view my work. My walks are slow, meditative and meandering. I am usually looking down as I discover all manner of Nature's treasures. 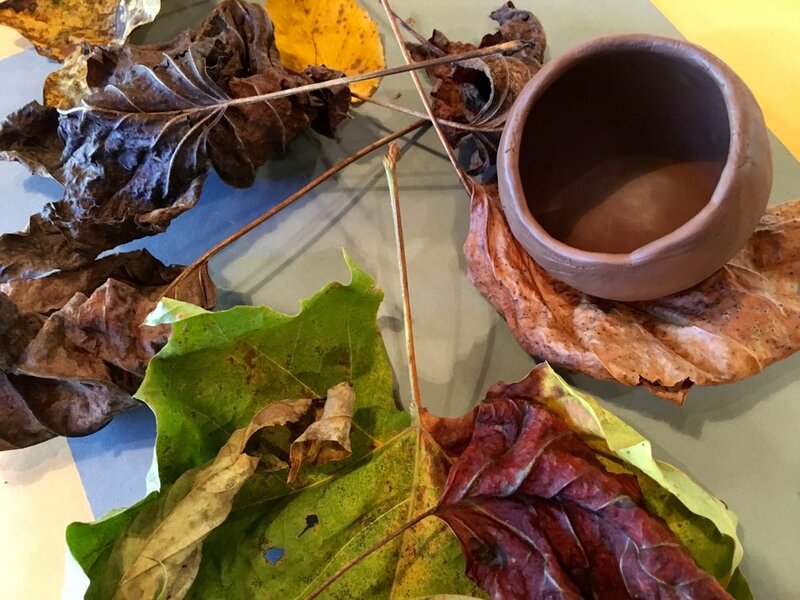 It is these treasures that inspire my work in clay. Therefore, I have displayed the work so the viewer will be looking down to view it. 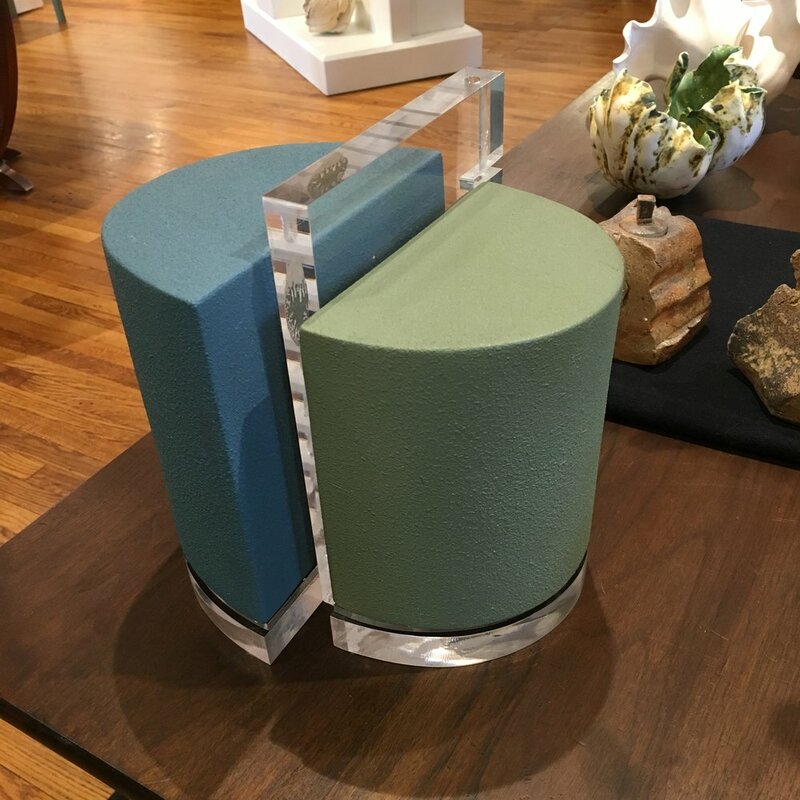 The pedestals have been stacked to create a type of geometric interpretation of a topographical map. The levels were added for visual interest. I also wanted to slow the viewer down by the way the pedestals were placed. my hope it to guide the viewer on their walk without their awareness of my intent... This required that I begin with a floor plan of the space to work with from the Bascom. The actual work of getting paperwork and work ready was done with the help of my very able assistant Mackenzie Patterson. Mackenzie was instrumental helping me invoice the show with all those required details like price, size, medium. She also helped me lay out where the pedestals would go in advance. 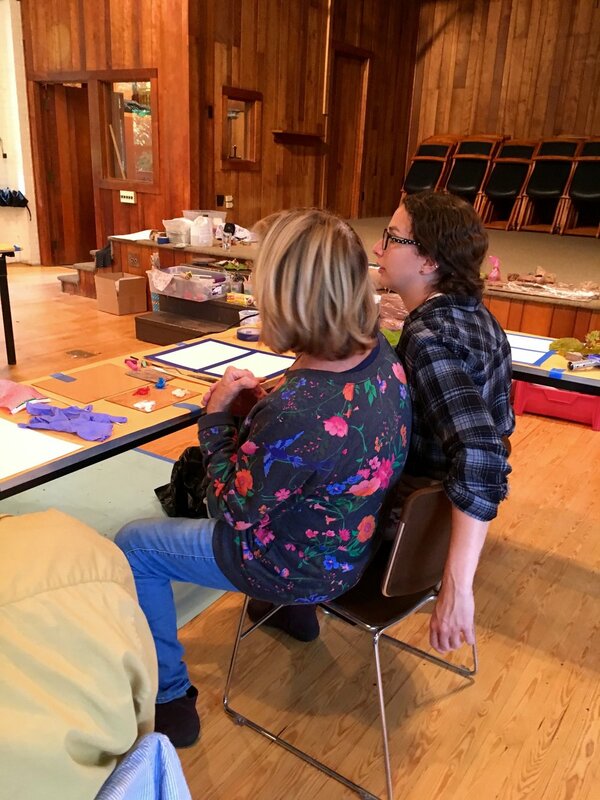 This required us to measure the commons at CCES, where I teach, cut paper patterns for all the pedestals we had available to use and then try to imagine how to lay them out in the Joel Gallery to achieve a certain visual look. We also had to allow for travel space for visitors to cross Joel gallery to enter another gallery on the other side from where the stairs and elevator were located. This was done in advance to avoid having to move heavy pedestals around any more than necessary and photographed. At this point, everything was carefully packed for a trip to the Bascom to begin the installation. This seems the perfect opportunity to thank Mackenzie for being a huge help with this challenging endeavor. I also want to add my gratitude to Mackenzie for being my artist assistant for the past year. She is an amazing young woman who just started her first year of college at USC. She is bright, creative, flexible, funny, mature, empathetic and will be an asset to mankind as she finishes her education and goes out into the world with one mission being to make a difference! How fortunate I am to know Mackenzie and to have benefited from her help in so many areas. Bravo and thank you Mackenzie!!!!!!!!! I am so glad we can continue our friendship because Greenville is also Mackenzie's home and she will be coming back from time to time! I would also like the thank everyone at the Bascom for their help, especially Teresa Osborn, Executive Director. I would also like to thank Maurice Laderoot for his help preparing the pedestals and for helping me get them into place for the installation. Hope you enjoy the images from paper patterns to the finished installation of "A Walk Remembered". I hope you will come to see the show at the Bascom! It opened September 2 and will be up through December 2 so you can see first hand the "fruits of our labor". The opening is October 6th, 4-6. Please let me know what you think of the show! I always love feedback! The following is from a catalog for " Contemporary Landscapes…Crossing Boundaries" at the McCall Center for Visual Art, Charlotte, NC 2005. If we are to sustain our lives and the lives of our children’s, children,we must promote a deeper understanding of the ecology of people and place. How are we connected with each other, with other animals and plants, with each other, with our surroundings? What are the ramifications of our surroundings? What are the manifestations of our choices?Are we in the midst of a cycle of careless stewardship of living systems that sustain us… or are we entering a new era of hope? 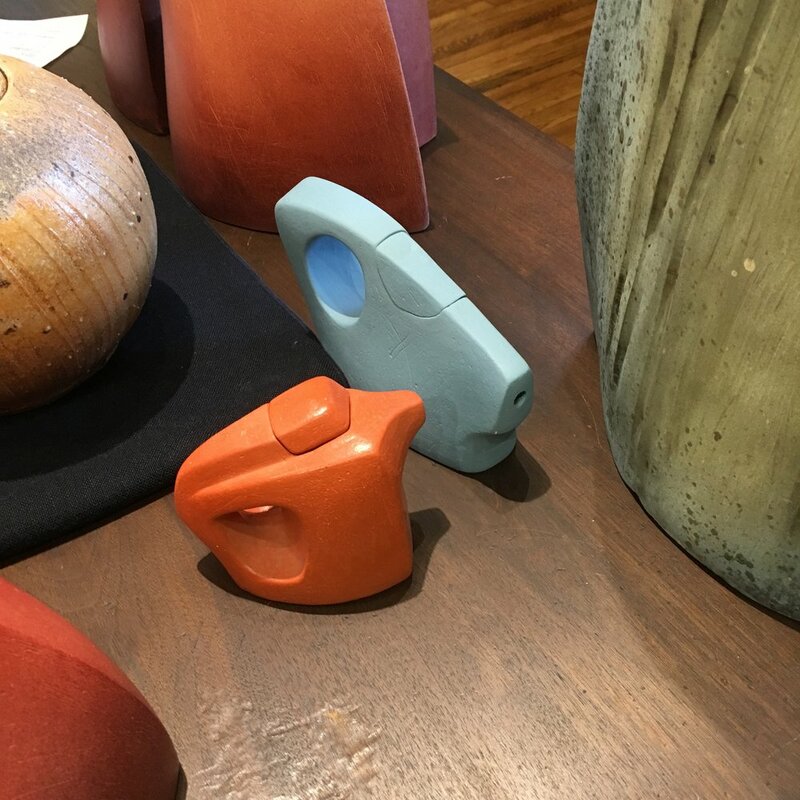 Alice Ballard’s exquisite ceramics of “natural objects” illustrate, by her hands, the fact that we are a part of an not apart from nature. If we understand that - we cannot escape our responsibility to use our own hands wisely.. Van W. Shields, director , Culture & Heritage Museums and the planned Museum Museum of Life and the Environment. Hope you will have a chance to get up to the Bascom to see my show. 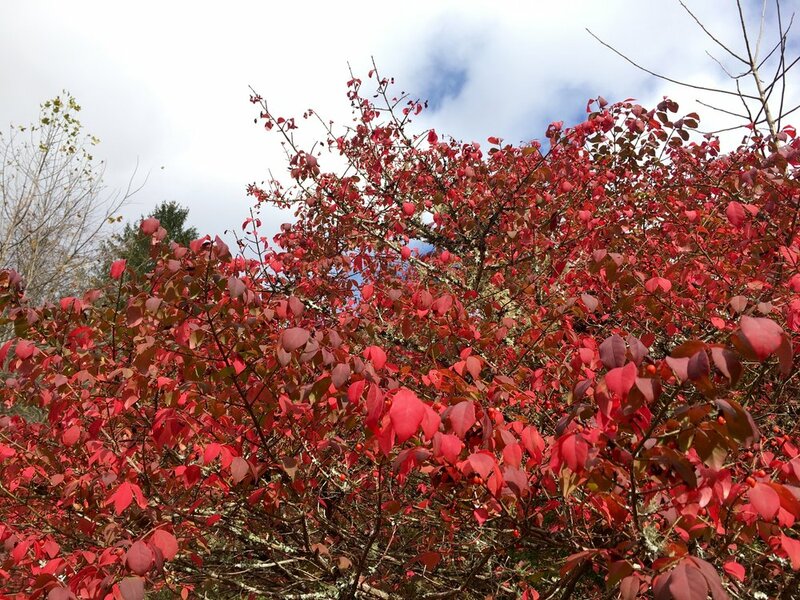 Along with my show, the Bascom and the surrounding environment, sculpture garden, the Barn and Highlands with great restaurants and hiking trails make it a great place to visit, especially in the fall. My art is a reflection of my relationship with natural forms. 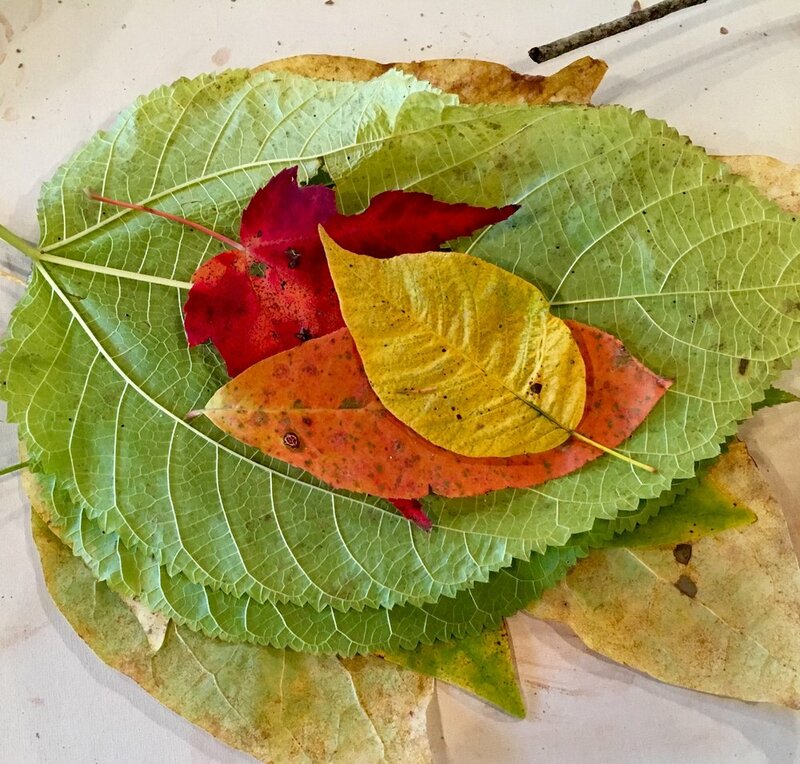 These forms come to me on walks, while I work in my garden, or appear as gifts from friends who share my fascination with the beauty inherent in Nature’s abundant variety of forms. It is often the metamorphosis of nature’s forms, as they change from season to season, that attracts me. I am endlessly drawn to that universal world in which differing life forms share similar qualities. I spend countless hours contemplating a particular form in order to feel its energy. It becomes a Zen-like connection not unlike a meditation. 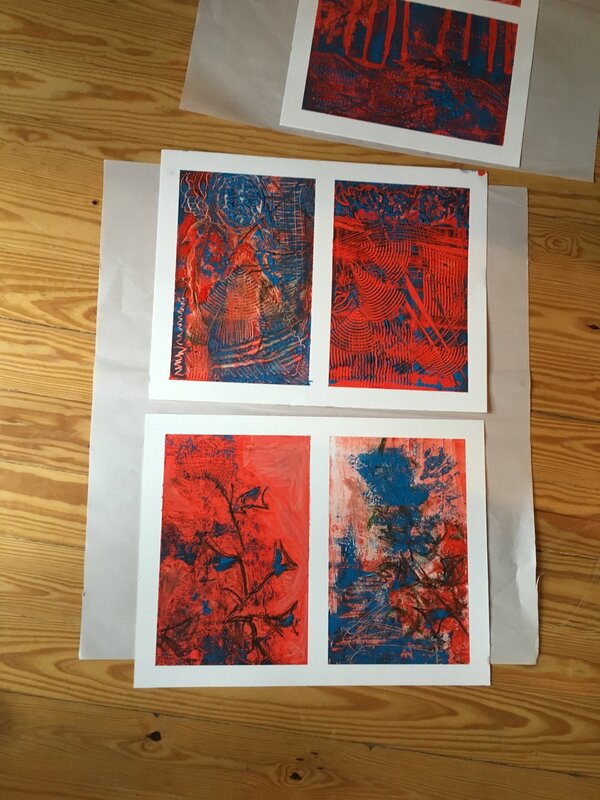 As an artist, I hope that those who choose to connect with my work can share some of the harmony and tranquility I feel through the creative process. Perhaps, at the very least, the viewer will give those small, often unnoticed forms in Nature a second glance. 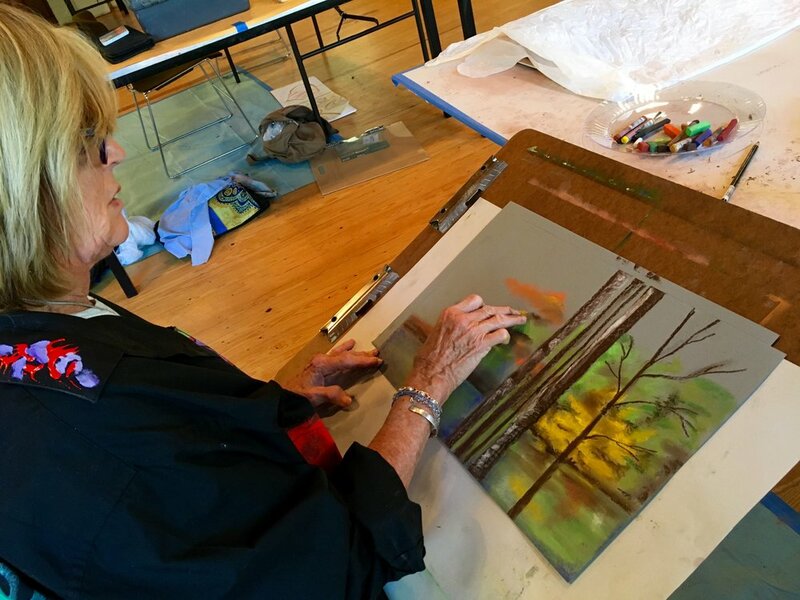 Alice Ballard received her Masters Degree in Art from the university of Michigan before becoming a professional artist and educator. 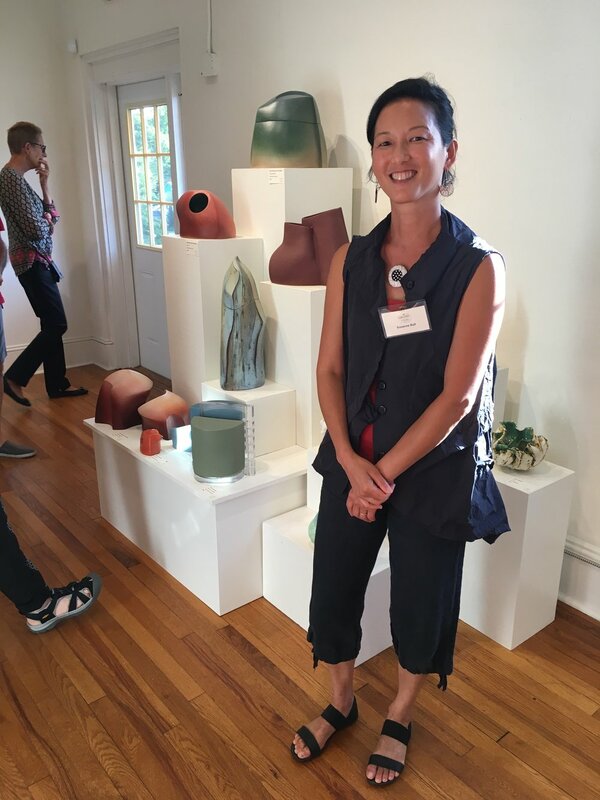 She received a Fulbright Grant to study in India, was one of 8 ceramic artists to be invited to the International Ceramic Colony in Resen, Macedonia, received a South Carolina Arts Commission Individual Fellowship and has work traveling work currently traveling in “Tradition//Innovation American Masterpieces of Southern Craft and & Traditional Art” organized by Art South. She is represented by Hodges Taylor in Charlotte, NC, Blue Spiral 1 in Asheville and Tao Evolution in Hong Kong. 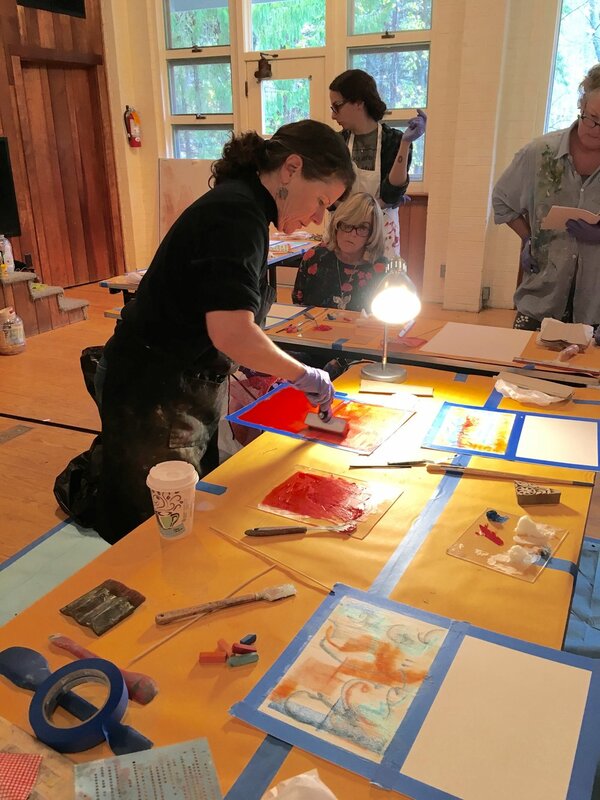 She has had solo shows at the Mint Museums, the Greenville County Museum of Art and has work in the collections of the Renwick Museum of the Smithsonian Institute in Washington DC, Arrowmont School , the Mint Museum of Art and the Greenville County Museum of Art. 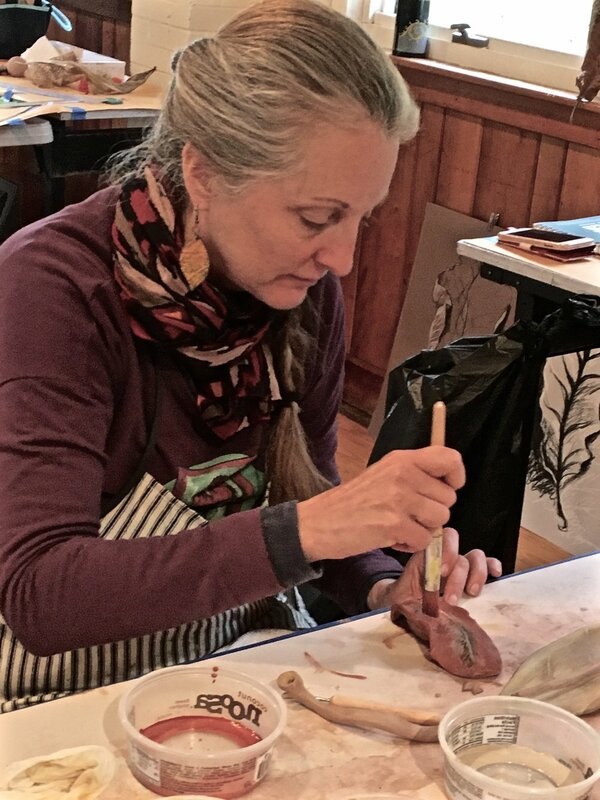 Her teaching experience includes Penland School of Crafts and she currently teaches at the SC Governor’s School for the Arts and Humanities and Christ Church Episcopal Middle School, both in Greenville, SC where Alice Ballard currently lives and maintains a studio. A few images to get you excited about the Lake Logan Retreat experience and what to expect. Join Us for Auction Weekend! 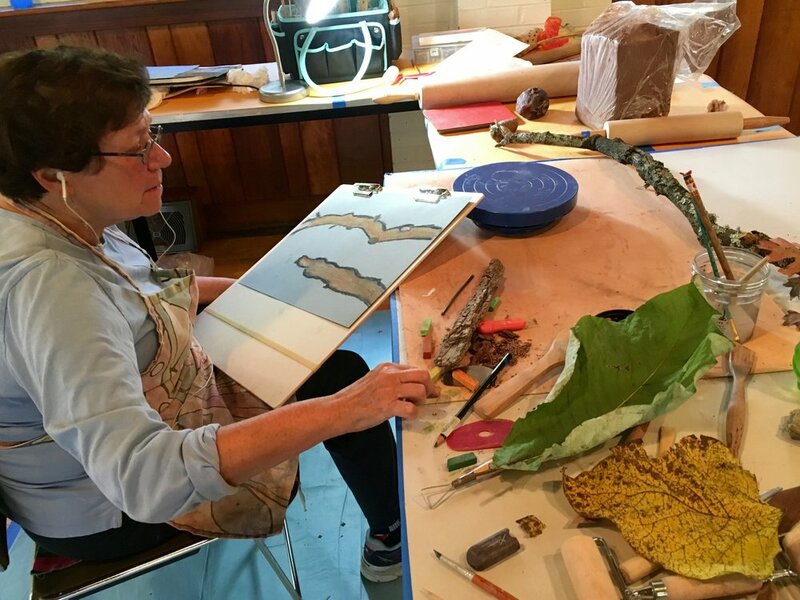 Registration is now open for the 32nd Annual Penland Benefit Auction on August 11 and 12, 2017. 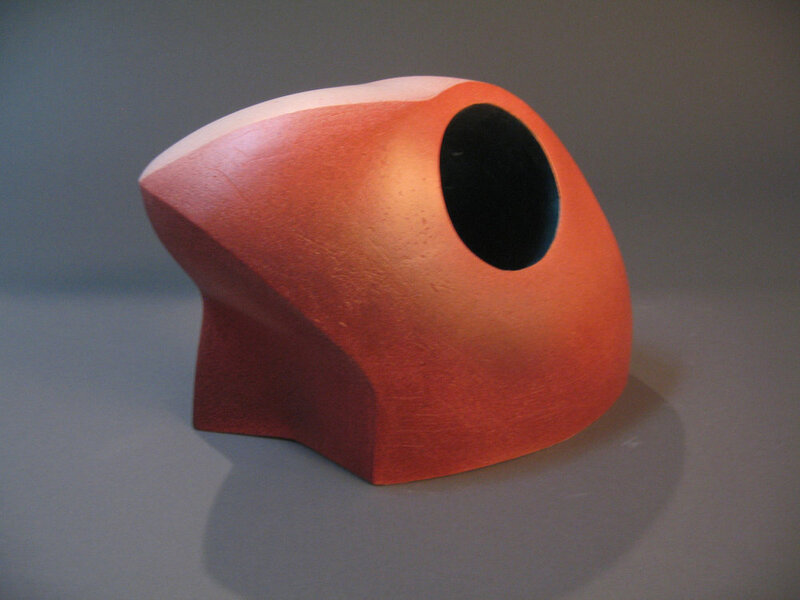 We are proud to announce that furniture designer and metalworker Vivian Beer will be this year's featured artist. 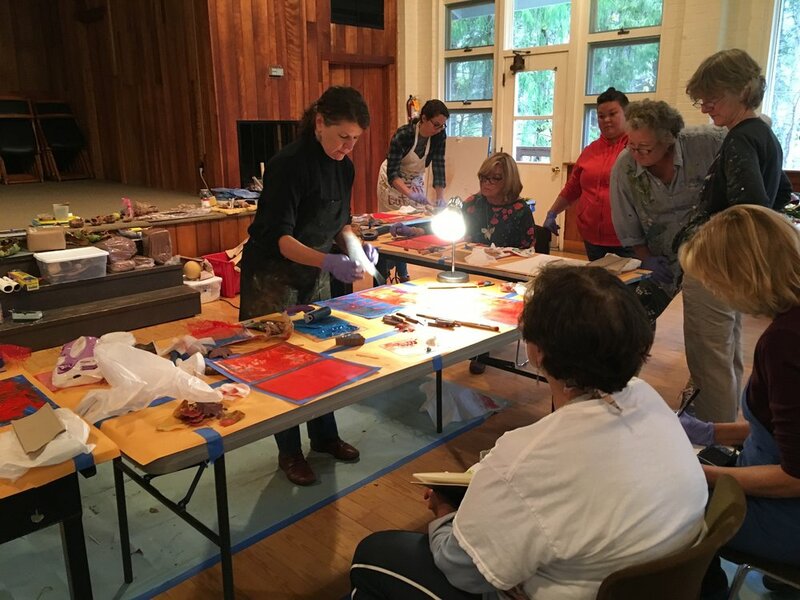 Vivian was a Penland resident artist from 2005 to 2008 and will return to campus this summer to teach a session 5 iron workshop. 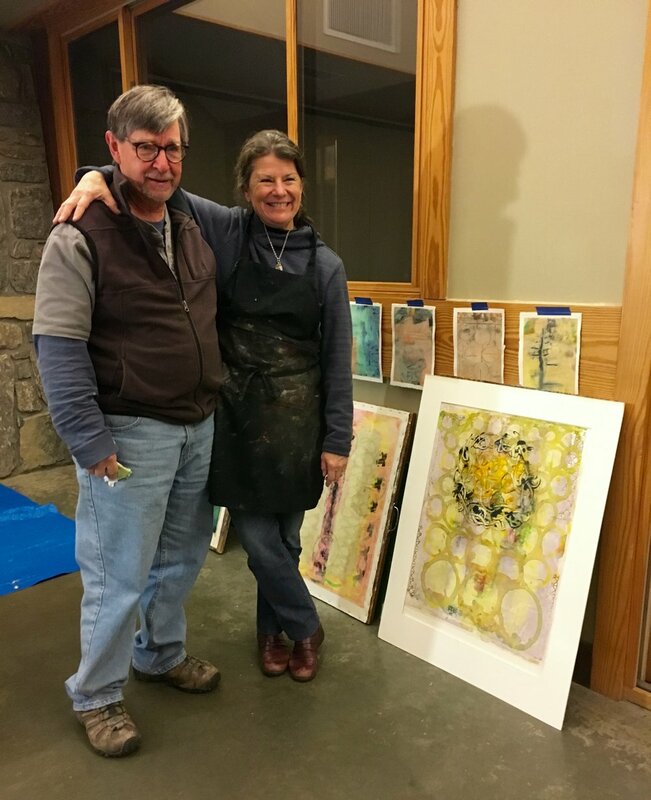 We are thrilled to be honoring longtime Penland friends and instructors Cynthia Bringle and Edwina Bringle as our 2017 Outstanding Artist Educators. And the beautiful mugs for this year's event are being made by Jacob Herrmann and Heather McLelland of Devon Court Pottery.